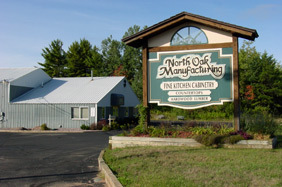 At North Oak Manufacturing we take pride in producing durable, maintenance free and attractive custom cabinetry. We want you to enjoy your new kitchen for years to come. 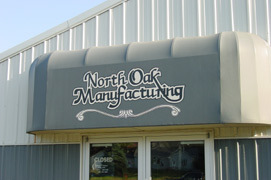 So, keeping that in mind, we fabricate our cabinetry using quality materials and time proven construction techniques. We offer a variety of solid wood door styles. These can be provided in your choice of wood species, including Red Oak, Hickory, Maple, Cherry, Mahogany, Ash, Birch, Walnut or Knotty Pine. Drawer box construction is of either melamine with the bottom dadoed into all four sides and sides screwed together, or of solid wood with dovetailed joints. All base and wall cabinets are constructed of ¾” thermofused melamine. Cabinet case parts are screwed together except for the back which is set in a dado on all four sides and glued. All our cases are built to be properly square and rigid. Any exterior exposed sides or ends will be covered with wood veneer. Open or glass door cabinet interiors can be finished with wood veneer if desired. Each cabinet is supplied with ¾” thermofused melamine adjustable shelves. Cabinetry is finished with your choice of stain, hand rubbed for even coverage, followed by a sealer coat and a top coat of catalyzed conversion varnish for a durable, washable finish. Our cabinetry features only quality hardware. We use lifetime guaranteed Blum concealed, self-closing hinges, Blum self-closing epoxy coated drawer slides, and Blum shelf supports with a 5mm steel pin for strength. To complete your cabinetry, your choice of knobs or pulls will be mounted to doors and drawers for a final personalized touch. Postformed plastic laminate countertops are available in your choice of colors and edge profiles. A wood edge can be added for a more distinct appearance. We are pleased to also offer custom fabricated Dupont Corian solid surface countertops which carry a 10-year manufacturer's warranty. Corian, now available in 38 colors, offers unlimited design possibilities. With our computerized cabinet design you can view your new cabinetry before any fabrication actually starts. This allows for new ideas and experimentation before your design and layout are finalized. Adding options to your kitchen can make it even more attractive and user friendly. Crown molding, gallery spindle rail, under cabinet light strips or glass doors can be very eye pleasing. Just as pullout wastebaskets, pullout shelves, a cutting board, appliance garage, spice drawer insert, lift up mixer shelf, silverware tray, Lazy Susan or vertical tray dividers can create a kitchen any cook will love to use. So, bring us your ideas and together we can make your dream kitchen a reality.